Deck the toybox with Melissa & Doug's top holiday toys — the perfect Christmas gifts for kids! Browse their Terrific 25 Toys, their picks for the very best new children's products this year. Or check out their holiday catalog or personalizable gift finder to help you select the perfect gift. From budget-friendly stocking stuffers to big presents with major impact, you'll find everything for your holiday list at MelissaAndDoug.com! Plus, enter MelissaAndDoug's Terrific 25 Holiday Gifts Giveaway! 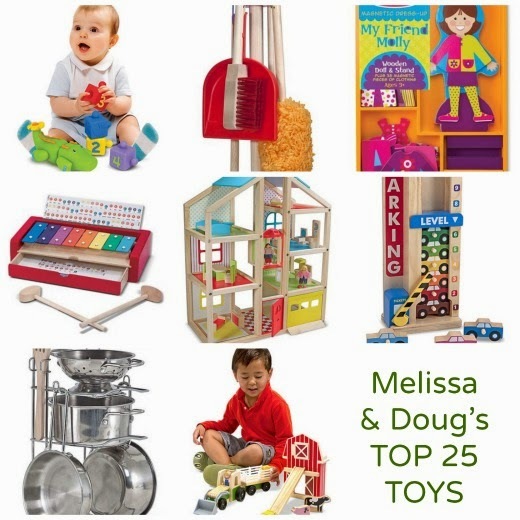 Melissa & Doug is giving away A Gift A Day from our Terrific 25! And: One lucky winner will WIN ALL 25 on Black Friday! For over 25 years Melissa & Doug has created toys, games, and more with an emphasis on value, quality, and design. From puzzles to puppets, plush toys to play food, magnetic activities, music, wooden toys, and much more, Melissa & Doug has something for everyone. In fact, Melissa & Doug offers over 2,000 unique and exciting products to both engage and educate children of all ages. We've loved Melissa & Doug for wooden puzzles, travel toys, and quality pretend play, from costumes to play food. Go check out the Terrific 25 Toys and see what the little ones on your list would love this season! Only 1 entry required to be eligible to win during the promotion period. Enter by 5pm EST 11/28/13. View all terms and conditions here. Disclosure: Melissa & Doug links are affiliate links. Thank you, I love Melissa & Doug stuff!